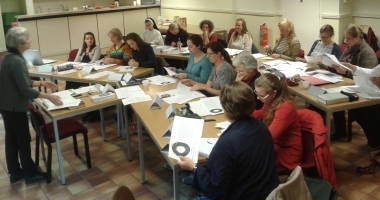 Starting from 2009, the Catechesis of the Good Shepherd has spread to several locations in the Netherlands, also for level III. We are members of the American National Association of the Good Shepherd and also offer training courses in English. 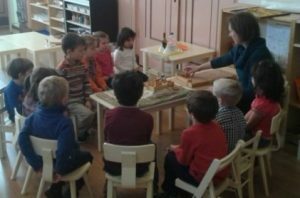 The Catechesis of the Good Shepherd is now present in Leiden, Sittard, Den Bosch, Rotterdam and Utrecht (check out these Dutch pages). 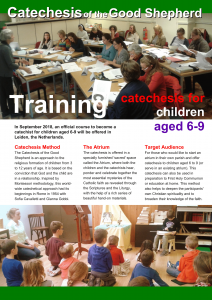 Since 2013 we regularly offer training courses for catechists in English (as in Dutch). These are led by trainers certified by the American National Association of the Good Shepherd. The next English course will be held in September 2018. Please download the flyer on this page or contact us for further details.